Triathlon Life! : Gimme some water. On Sunday evening at 6:30 I began a 36 hour water fast (cleansing, detoxification). And not for the reason to starve myself or to lose weight, but for the benefit of its natural healing and cleansing process. A water fast is probably not for everyone to try yet I think it is good for the body to go through some type of detox program once in awhile. I started with 1 gallon of Distilled water. On Monday morning rather than having a cup of tea with my wife I had hot water in a cup. Thus began my long day of consuming only water throughout the day. The day at work went well but after 24 hours (6:30 pm) I felt lightheaded, droopy eyes, and overall fatigued, kind of like I do when I try to stay awake all night. I also had to wrap myself in my house coat because I was cold. I guess getting cold is also a side effect along with a mild head ache. No bowel movement today. I went to bed around 9:00 pm. I was so happy to wake up Tuesday morning at 6:15 am to break my fast. 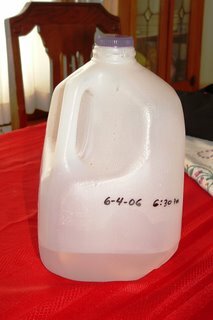 I took a picture of the 24 ounces of water left in the jug and dumped the rest down the drain. After washing my face I ate a banana and made a smoothie that my son was also looking forward to have with me. I put all my favorite ingredients in a blender (that my son normally would not eat) to blend them together. This mornings smoothie consisted of 3/4 cup yogurt, 3/4 soy milk, 4-6 ice cubes, 2 teaspoons of peanut butter, 1 tablespoon of flax seed, and some strawberries. We drank up and were singing, "umm, umm, good". I felt refreshed and ready to start my day. As the experts say, that the bowels should move within an hour or two after the first meal, I was right on schedule. While fasting I gained an appreciation of the lesson learned in self-restraint. That is, to be able to control my choice of what foods to put or not to put in my mouth. I think a water fast is harder to do than any other fasting. I've done a 2 day apple fast and found that to be easy. My next experimental fast will be a juice fast. I'll try that some time in the fall when I can juice apples and pears when they are in season. An article on Nutritional Program for Fasting can be read on line. You are amazing Papa Louie, You inspire me to try new things! That sounds like amazing disciple- but it also sounds like it worked. I really like the sound of the smoothie, have to try that. Baron Baptiste has a detox diet that I want to try in his book 40 Days to Personal Revolution. It is a gradual elimination of certain foods, hopefully with the goal of keeping bad things out on a permanent basis. You've got some discipline! How are you feeling a day later? Do you notice a difference in hunger, or how you are processing foods? Wow, very interesting...did you do any working out during that time? If not, how much time did you take off? Maybe I'll try that sometime...i need some work on that self discipline of putting or not putting food into my mouth! I love the idea of that kind of dicipline. Spiritual & physical. Awesome when you can make them both meet. Thanks for the info to... I'll read up. that is interesting, i think i may try that sometime as well, but my experiment will have to start on a saturday so when i get the woozies i can lie down and not be at work. Things are flying in the air.